I offer since 2016 to share de teachings I get with Gunnar Jinmei Linder in the form of private workshops and lessons. I was frequently asked by my customers for teaching but as a student myself, I had to talk with my teacher to get his approval. He felt my bases in his style of playing were clear enough to be transmitted. 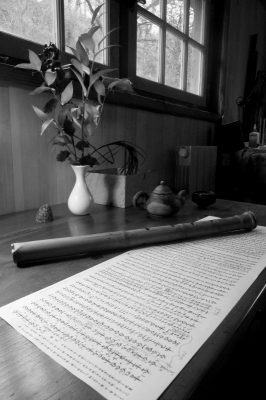 First sensitive approach of the instrument; how to integrate the flute to your body and breath. Holding, posture, mouth position and seeking the first sound. Discover and practice an ensemble of playing techniques focused on breath and sound. How to modulate timbre, volume and pitch and get conscience of what is happening with the body. Basic exercises in order to be able to play all the notes. Study on scales, discovering the Kinko notation system. Playing the first repertoire, Min’yo folk songs and Komori uta children songs. Lessons are taken in my workshop; visiting me is also a chance to discover this beautiful area of France ! I can borrow an instrument during classes. They take place in my workshop in a warm and intimate atmosphere conducive to concentration. We choose the dates together (preferably on weekdays). Intensive class days taking place in my workshop. The fees are 60€/day (can be cheaper for 2 or 3 persons). a vegetarian meal is offered at lunch.